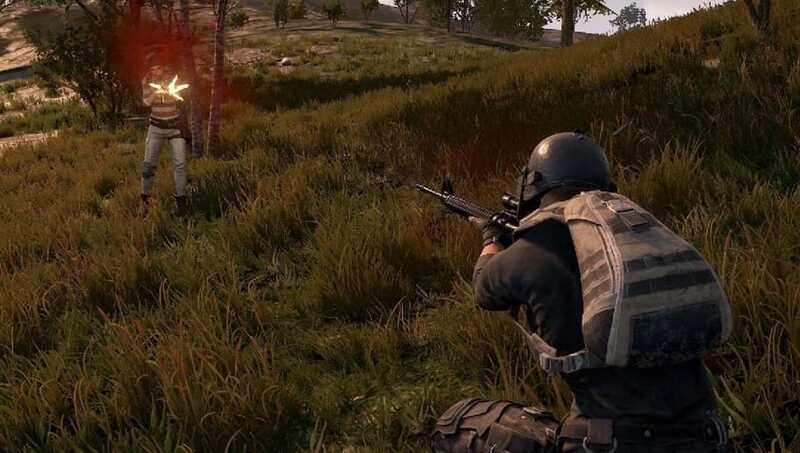 PUBG Xbox One patch 18 will offer various new features and improvements, including dynamic weather, limb penetration, various performance improvements and more. Bluehole is currently testing out the changes on the game’s Public Test Server (PTS) before PUBG Xbox One patch 18 hits the game’s live servers, and is free to download for all those who own a copy of the game. Please note that only the NA servers are available in the PTS, and some game modes might not be available. Bullet penetration system is now applied to forearms. When a bullet hits the forearm of the character, it will penetrate following its ballistic trajectory. The result will be different depending on whether the forearm is blocking more vulnerable body parts. 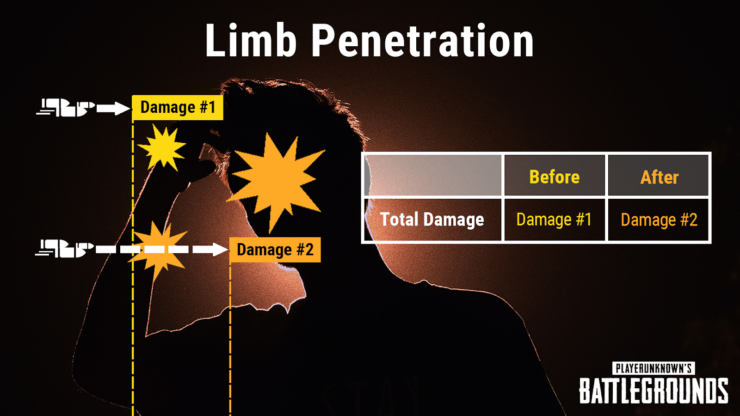 When a bullet penetrates a forearm and strikes a more vulnerable body part behind it, the greater damage will be applied. In other words, if a player’s forearm takes a bullet while blocking their head, the full headshot damage will be applied. This penetration system works for the head, torso, and waist only. When getting on a motorbike, if the driver’s seat is empty, it’s now much easier to enter the driver’s seat (and not accidentally get on the passenger seat). Weapon attachment management when replacing items has been improved. Removed or replaced attachments will now drop onto the floor if there is no room in your inventory. When attaching directly from loot, the replaced attachment will be dropped on the floor if there is no room in your inventory. When replacing an extended magazine with a quickdraw magazine, the extended magazine and overflow ammunition will be dropped on the floor if there is no room in your inventory. Colorblind settings have been improved. The following colors now change according to the selected colorblind type. Markers placed on maps are now numbered, so color is not the only way to distinguish them. Eliminated teammates can now place markers on the map. Kill feed now displays personal knock-outs. In Squads, when the last surviving teammate accidentally disconnects, all teammates will receive rewards up until the point of disconnection. If the disconnected teammate is able to connect back into the same match and gets a higher score, all teammates will receive updated rewards. Dynamic weather has been added to Erangel and Miramar. Overcast setting includes dynamic weather, and includes rain, fog, etc. during the game. Erangel has received some improvements. Small clusters of houses have been added to some areas of Erangel. More tactical landscapes have been added near the river. Added trees in the open area surrounding the Sosnovka Military Base. Miramar has received some improvements. More dirt roads have been added for better vehicle effectiveness. Certain high-slope sections of roads have been lowered to enhance vehicle effectiveness. When spectating a player, their aiming movement is now more in sync with the spectator view. To give an example, we’ve improved situations where it appears players are shooting far behind moving targets, when in fact on their screen, they’re shooting directly at them. Smoke and flames from vehicles have been optimized to improve frame rate. Server performance has been improved by adjusting the replication rate. Previously, replication for all visible characters in sight was refreshed every frame. Now, replication rate differs according to distance from the player. We expect approximately 15% increase in server performance. Network code has been adjusted to slightly increase server performance. Optimized CPU performance by improving the graphic rendering function. Optimized GPU resources to lower GPU burden and improve performance. Optimized attachment related rendering resources to improve performance. Optimized fog to increase performance. Previously 2 separate fog effects were used for the overall effect, they’ve now been merged together to improve performance. Optimized grass assets to reduce memory resources used and improve performance. Optimized the physics calculation of moving boats and moving vehicles on the beach. Settings will now be stored in online storage – Your settings will be saved even if there’s a new patch. Fixed an issue where destroying doors with frag grenades or molotovs did not display debris. Fixed an issue where a frying pan and a weapon could be held at the same time. Fixed an issue where spectating in FPP showed inaccurate character locations. Fixed an issue where leaning was possible while in an emote animation. Fixed an issue where two players moving in a small space could sometimes get stuck. Fixed an issue where the player character would perform jump motion for a short time when crouch key is rapidly pressed multiple times. Fixed an issue where reticle settings would be reset when the weapon was dropped and picked up again. Fixed an issue where the spectating camera would look through a character when the game finished. Reduced the chance of players encountering situations where opponent’s weapon floats in the air. Fixed an issue where throwables could pass through character models. Fixed an issue where voice chat UI would always be displayed when using killer spectating function under certain conditions. Fixed an issue which prevented players from changing the red dot reticle when using an SMG. Fixed an issue where the stun effect from the stun grenade was weaker than before. Fixed an issue where the camera angle rotates up to 180 degrees up/down in FPP and TPP mode when freefalling. Fixed an issue where the character would stand up and lie down repeatedly when moving uphill while lying down. Fixed an issue where some weapons could be seen through when a character is moving right while in ADS position and lying down. Fixed an issue where there was replay related text shown in the report pop-up window after dying. Fixed an issue where sprinting would stop when moving at a certain angle with the L-Stick. PlayerUnknown’s Battlegrounds is available now for Xbox One and PC.